When the temperatures drop precipitously, there's a risk that your pipes will freeze, leading at the very least to inconvenience and at the worst to a burst pipe and a lot of mess and expense. 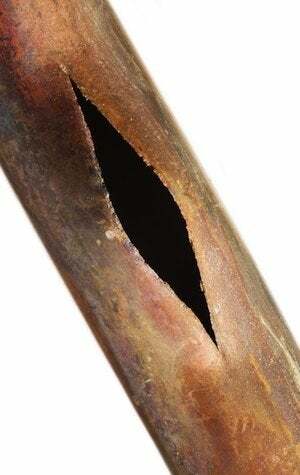 Learn the signs of a frozen pipe and how to defrost it before it can inflict real damage. Of all the challenges encountered in a severe winter, a frozen pipe may be the one that strikes the most fear into the heart of the typical homeowner. After all, the risk is real: If temperatures drop low enough, the water within a vulnerable pipe may freeze and expand, causing the pipe to rupture. Hours or days later, when the ice finally abates, freely flowing water can pour out of the compromised pipe, leading to a host of hazards. Thankfully, there’s a bit of good news: Not every frozen pipe ultimately bursts open and leaks. Indeed, if you’re at home and aware of the issue, you may be able to thaw a frozen pipe early enough to prevent any damage. Usually, homeowners discover that a pipe has frozen when they turn on a tap and nothing comes out, or when a toilet fails to refill after flushing. 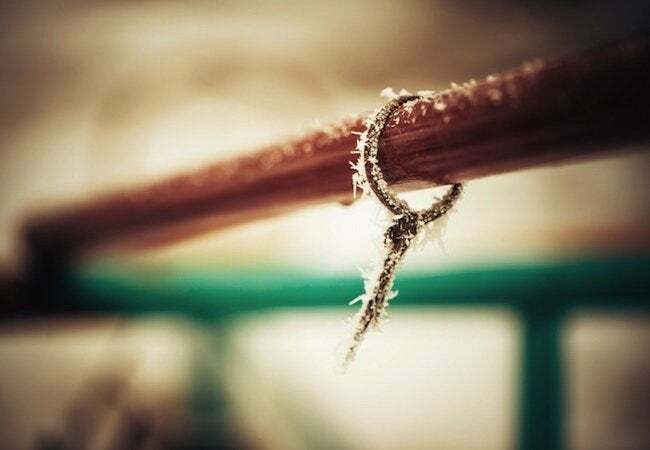 Sometimes, there are even signs in the pipe itself, such as an obvious bulge or a thin layer of frost covering the pipe. Time is a factor here. If, according to the weather forecast, temperatures are going to remain low, you may have time to contract with a local plumber to safely handle the situation. If, however, temperatures are anticipated to rise in the near term, or if you simply cannot reach a qualified professional quickly enough, follow the steps outlined below to thaw frozen pipes on your own, using a few household items that you probably already own. Sometimes the hardest part is simply locating the frozen pipe. One trick is to open all the faucets in your home. If water doesn’t reach a particular faucet, trace its plumbing lines as they travel away from the fixture. Every few feet, inspect the plumbing with your hands (a frozen pipe literally feels ice cold), continuing until you locate the affected area. If none of your faucets are getting a flow of water, the problem may be with the main supply pipe. You can typically find yours in the basement or crawl space, on the side of the house that faces the street. Once you have found and confirmed the frozen pipe, go to the main water supply valve and turn it clockwise to its “off” position. Next, open all the sink faucets and tub spouts in your home, draining what remains of the water in the system; flush your toilets as well. Now—armed with a bucket, mop, and two or three towels you wouldn’t hate ruining—return to the frozen pipe. At this point, your mission is simple: Apply heat to the frozen pipe. To do so, homeowners typically use such things as hair dryers, heat lamps, and heating pads. Low-tech solutions can be equally effective. For instance, you can pour hot water over towels draped over the frozen spot. More important than your heat source is your technique. Remember that it’s best to begin heating near the edge of the frozen area, on the side closest to the nearest kitchen or bathroom. That way, any steam or water generated by the heating can escape the pipe. Continue heating, inching along the frozen pipe one section at a time. Alternatively, if you can’t directly apply heat to the frozen pipe, try running a space heater in the nearest accessible area. Another option: Turn up your thermostat by a few degrees. Any increase in your utility bill would be small in comparison with a costly repair. Once you are confident the freeze has melted, return to the main water supply valve and turn it on—partially. Then go back to the pipe and inspect it for leaks. If it did rupture, turn off the supply again, call the plumber, and get to work cleaning up. If, on the other hand, the pipe appears to be channeling water properly, then go ahead and turn the water supply all the way on, and close any faucets or spouts that are still open. To prevent a similar situation in the future, take steps to protect your at-risk pipes. There are several options available to the average homeowner that don’t involve rerouting the plumbing or modifying the heating system. First, consider insulating your pipes—if not all of them, then at least those in the coldest sections of the home, such as the basement, crawl space, attic, or garage. You can go a step further and install a heat tape, an electrical device designed expressly to prevent frozen pipes. At the very least, if you know that brutally low temperatures are coming, you can always open the cabinets under your sinks to warm the exposed pipes by a few degrees. And, finally, as a last-ditch effort, you can open all your faucets and spouts to a trickle, just to keep the water flowing through the pipes. Indeed, with preparation and forethought, you can ensure that you’ll never again find yourself crawling around the basement floor, cold and damp, with a hair dryer in your hand.